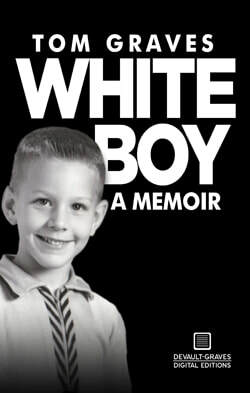 White Boy: A Memoir is one man's unvarnished story of love, loss, race, Memphis, and a dark past. Everything is laid bare when Memphis author, journalist, and college professor Tom Graves takes a vivid and deeply introspective account of his life. Certainly no one can accuse Graves of looking back through rose-colored glasses as chapter after riveting chapter he confronts his family's racist past, shares his eyewitness memories of the integration of Memphis public schools, details his dating escapades with women from another race, and brings you to tears with his powerful account of the roller-coaster relationship with a Sierra Leone native whom he met on Match.com and brought to the U.S. to become his bride. This courageous and unforgettable memoir is sure to stir—and perhaps even prompt you to reconsider—your own feelings about love and race.